Animal Friends: Shelters Unite for "$30 @ 3" Dog Adoption Promo! Pittsburgh’s three major shelters – Animal Friends, the Animal Rescue League (ARL), and the Western PA Humane Society (WPHS) – have stepped up in a united front to save pets caught in the middle of a licensing suspension at Triangle Pet Control Services. As a result, the 3 shelters are at capacity with dogs. They are asking for immediate help from the public. All 3 shelters are running a $30@3 adoption special, meaning any dog over the age of 2 years is available for just a $30 adoption donation – at all 3 shelters. All adoptions will be thoroughly screened to ensure loving, lifelong matches. “Since the closure of Triangle Pet, the Animal Rescue league has seen a spike in surrenders of both dog and cats. We are at the point where all of our cages are full, animals are being housed in offices, and all of our current foster homes are at capacity,” says ARL Executive Director, Dan Rossi. 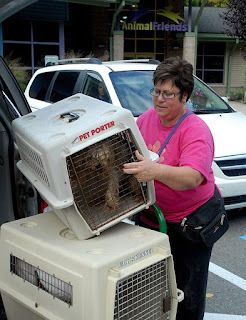 On October 1, 2012, Triangle Pet Control’s license to operate was revoked and the business was ordered to no longer provide animal control or kenneling services for dogs. Animal Friends, the Animal Rescue League, and the Western PA Humane Society came forward to rescue pets from Triangle or offer veterinary assistance. More then 20 dogs were transferred to Animal Friends and Animal Rescue League, while the Western PA Humane Society impounded a dead dog found on Triangle’s property. On October 10, The Western PA Humane Society Humane Chief Humane Society Officer, Ron Smith filed citations against the owner of Triangle Pet, Bernard Dudash and Kennel Manager Paul McIntyre, for failure to provide veterinary care for a pit bull that had been in their custody since September 11 of this year. According to the citations, the dog died in its cage on the morning of October 4 and was never taken to a vet, despite being told to do so by the Allegheny County Dog Warden on October 1. For more information, visit the shelters’ websites at www.ThinkingOutsideTheCage.org, http://www.animalrescue.org, and http://www.wpahumane.com. Pittsburgh’s animal shelters are non-profit organizations that rely on donations and community support. Animal Friends is a non-profit companion animal resource center serving the needs of pets and people since 1943. Our progressive programs have been nationally recognized and include humane rescue, shelter and adoption services, humane education, pet behavior classes, pet-assisted therapy, wellness programs and more. At Animal Friends, we know that shelter and adoption programs, while important, are a reactive solution to pet overpopulation and will never solve the overpopulation crisis. That's why Animal Friends has developed a comprehensive, community-wide spay/neuter initiative. By providing low or no-cost spay/neuter surgeries to low-income pet owners, feral cat colony caretakers, Pit Bull owners, and shelters and communities that lack spay/neuter programs, Animal Friends is well on our way to spaying or neutering over 30,000 pets in three years. Through these efforts, our goal is not just to relieve pet overpopulation and unnecessary euthanasia in southwestern Pennsylvania—but to end it. Animal Friends is supported by donors, volunteers and a staff dedicated to ensuring the well being of companion animals, while ending overpopulation, abuse and unwarranted euthanasia. For more information, visit www.ThinkingOutsideTheCage.org. The Western PA Humane Society is proud to be an Open Door Shelter. This means we never turn away an animal in need. We currently take in over 13,000 animals each year. We have been helping people and their pets for over 135 years. We are proud of our role in the community and are always looking to improve the concept and perception of open door shelters. The Western PA Humane Society is not directly funded through local, state, or federal tax dollars and receives no financial support from donations made to any regional or national animal welfare organization. You can help in many ways. Consider adopting a pet. Make a monetary donation. Become a member of the Western PA Humane Society. Volunteer your time. Foster an animal waiting for a new home. For more information, please visit our website at www.wpahumane.org or visit one of our two shelters.